This is Naked Capitalism fundraising week. 793 donors have already invested in our efforts to combat corruption and predatory conduct, particularly in the financial realm. Please join us and participate via our donation page, which shows how to give via check, credit card, debit card, or PayPal. Read about why we’re doing this fundraiser, what we’ve accomplished in the last year, and our fourth target, burnout prevention. This is a story of repeated whistleblowing by concerned global citizens, including me, and of key public information missed again and again, not only by regulators and law enforcement agencies, but by journalists and bloggers (also, alas, including me). We enter the story via Breder Suasso, a New Zealand FSP since May 2014. Back then it quickly attracted attention for its tenuous New Zealand presence (hats off to a whistleblower ahead of the crowd: the eccentric but determined NZ ex-cop Grace Haden). Later, NZ journalist Gareth Vaughan noticed Breder Suasso’s vaunted but whiffy creditor-defeating secrecy. Most recently, at Naked Capitalism, Breder Suasso got a writeup for its evident connections with Mossack Fonseca, of the Panamapapers, and with Rietumu Bank, facing charges as a major actor in a massive French tax fraud. Had GSL of Russia taken a harder look at this information, they could have saved themselves some trouble. A year after opening their Breder Suasso account, a process that required minimal-to-nonexistent KYC procedures, and establishing a credit balance, GSL still hadn’t managed to transfer any money out of the account, and had received no explanation from Breder Suasso’s elusive customer services department. GSL had, however, been billed USD350 for an unrequested credit card, and hit with an unexplained direct debit of USD1,250; at least that was reversed, on request, but then the account was frozen by the “Compliance Officer”. By this point GSL were considering legal action, but then, again for no obvious reason, the account was unfrozen, commissions were refunded, and GSL were able to transfer out the remaining balance, presumably with a sigh of relief. Ms Jaswant Narwal, Deputy Head of Fraud at the Crown Prosecution Service, said: “Following a thorough investigation by Kent Police, the CPS has authorised charges against six men in connection with an alleged carbon credit fraud which cost the public revenue in the region of £11m. “It is alleged that between 1 January and 31 July 2009, Narinder Chada, Gurmail Dosanjh, Sukhdev Singh and Dhanvinder Basra cheated the public revenue by creating a chain of bogus companies which traded in carbon credits for the purpose of committing a fraud on the VAT system. The defendants are accused of using an MTIC style fraud to give the appearance of legitimate trading, allowing the companies to reclaim VAT paid out on purchases of credits along the fraudulent chain. “Each of the four men is charged with one count of conspiracy to cheat the public revenue, contrary to section 1 of the Criminal Law Act 1977. “They, along with Daniel Andrew Barrs and Daniel Barrs, are also charged with money laundering, contrary to section 327 of the Proceeds of Crime Act 2002, contrary to section 1(1) of the Criminal Law Act 1977. There’s no mention of Global Transaction Services in this press release, burying the Breder Suasso connection a little deeper. According to the FCA’s Basic Details tab here, Global Transaction Services’ registration was cancelled in October 2014. That’s confusing. It might be an indication that the bad news about its principal, Daniel Barrs, who was charged with money laundering a full year earlier, was pretty slow to propagate, even between UK police and UK regulators. On the other hand, why did FCA terminate the registration, if that’s what they did, before the Barrs’ trial had delivered a verdict? FMA had by then long since concluded, very athletically, that there was nothing wrong with Breder Suasso. 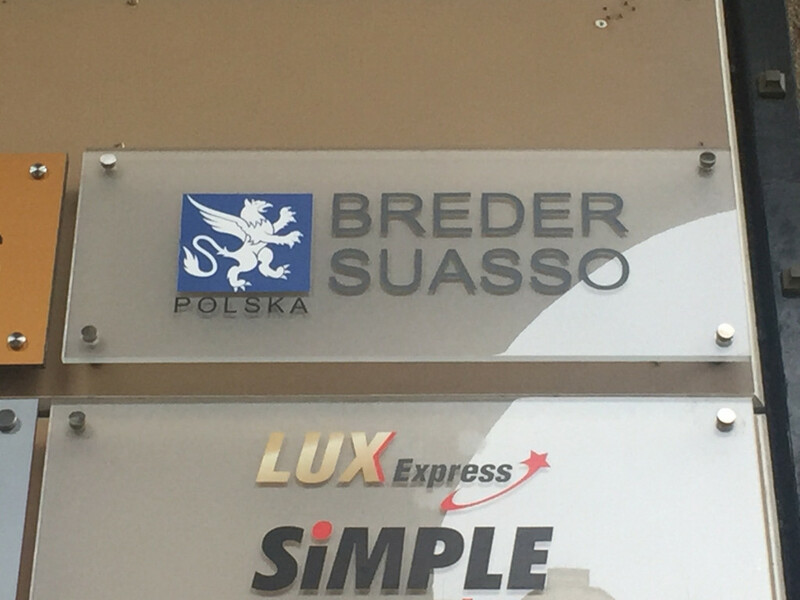 Breder Suasso retained its FSP registration. There’s really not much sign of a connection to New Zealand at all, apart from the FSP number. Rob Everett of FMA would now definitely think “that doesn’t make any sense”, but back then FMA was new to this role, and was soon looking in some other direction, and had its hands full with other unexpected FSP horrors: an alleged $4Bn fraud, via another group of FSPs. A Horley man and his father from Lingfield have been jailed for their part in a multimillion pound tax fraud. Daniel Barrs, 29, of Suffolk Close, was given three sentences of three years each, and his father, Daniel Andrew Barrs, 65, of New Place Gardens, Lingfield, was given three seven year sentences for facilitating the laundering of more than £23 million. The jail terms will run concurrently for both men. Their crimes came to light following a four-year investigation by the Kent and Essex Serious Crime Directorate. Note that even in April 2015, there is no news source, anywhere, connecting Breder Suasso via Global Transaction Services (UK) to the money laundering Barrs. That link is deducible from UK Companies House and the Wayback Machine, but no-one looked, not even anally-retentive bloggers. On Breder Suasso, the word is out in Russia, by mid 2015, via the press centre of tax specialist GSL, as we have seen. After that bad review, Breder Suasso can forget about attracting all but the most desperate Russian clients. In the past, Breder Suasso Limited used the services of Global Transaction Services LLC, which is regulated by the Department of Banking and Finance of the State of Georgia, USA. There’s nothing about that particular tie-up in the Wayback Machine. Still, via an archive of the company info webcrawler aihitdata.com, that documents many of the strange shifts in Breder Suasso’s company profile, we can see that GLS’s memory may not be playing tricks, and we even get a shot at nailing the timings down. According to the archive, the aihitdata robot first identified Breder Suasso’s primary contact address as 1841 Piedmont Road, Cobb County, Marietta GA 30066, U.S., on April 1 2014. This is indeed the address of Breder Suasso LLC, another Georgia company, which must be how the robot came to record it. It is also the registered address of Global Transaction Services LLC of Georgia, which sounds ominous. According to U.S. Attorney John Horn, the indictment, and other information presented in court: Daniel Barrs, of the United Kingdom, ran a money transmitting business located in metro Atlanta named “Global Transaction Services” (GTS), along with several interrelated entities that transmitted hundreds of millions of dollars’ worth of wires on behalf of customers located around the world, many of whom Barrs knew were not able to obtain access to U.S. banking on their own and were sending or receiving wires from countries that posed money laundering concerns. The indictment lists various examples of the types of transactions that GTS processed while Barrs ran the company, none of which resulted in the timely filing of a SAR. For example, GTS transmitted wires totaling more than $700,000 for two entities even though publicly available press releases from the U.S. Department of Justice and Federal Bureau of Investigation stated that the entities had been charged with running a large-scale offshore asset protection, securities fraud, and money laundering scheme. GTS transmitted wires totaling more than $900,000 for another entity even though a publicly available press release from the U.S. Department of Justice stated that an individual under indictment for operating a Ponzi scheme had used the entity to commit the offense. In another example, GTS transmitted wires totaling more than $1.5 million for a Cyprus-based company that had a limited public profile, with no website or business listings, and that was listed on various publicly available websites as being associated with potential fraudulent credit card charges. In yet another example, GTS transmitted wires totaling more than $2 million on behalf of a Belize-based company that was publicly listed in various websites as being associated with illegal spamming activity and internet fraud. The Georgia GTS was incorporated in April 2009 and dissolved in November 2015. So to all appearances, the scam has now come to an end. Appearances can be deceptive, though. There still seem to be a few loose ends in the GTS story, even now. Thanks to OpenCorporates, it’s a lot easier these days to elucidate global connections between dodgy businesses than it was, even as recently as 2013. Even if our belief that GTS and Breder Suasso are still in reasonable fettle is correct, we shouldn’t necessarily blame the Kent and Essex Serious Crime Directorate and the FBI (presumably behind the US grand jury indictment) for leaving key pieces of GTS intact, particularly since we’re not doing much better ourselves. We noticed the Georgia Breder Suasso company in our April 2016 post but didn’t dig down into it. Without the huge prompt from the May federal indictment, the historic connection to GTS (UK), GTS (Georgia) and NZ Breder Suasso, via the convicted Daniel Barrs duo, eluded our insufficiently questing eye. We could have got a significant chunk of this story six months ago. The UK company, Global Transaction Services (UK) Ltd, which at the time of writing is still live, is currently directed by Hannah Vernex-Loset, who gives an address in Georgia, USA. Daniel Barrs “The Younger” (see the Surrey Mirror story) was a board member until April 2014. James Mallaburn, a Briton who gives a London address, was a director until September 2015. 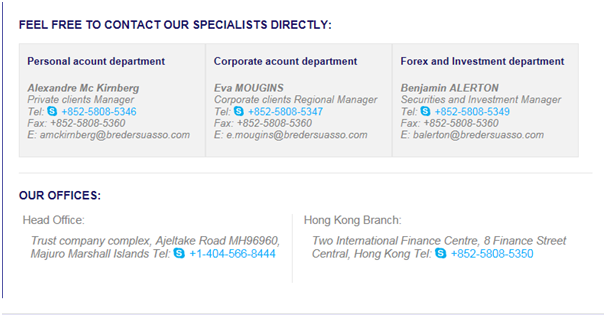 A certain Hong Kong company, Global Transaction Services (HK) Limited, is also still live. A very rare dip into the vast Naked Capitalism research budget, to the tune of HKD22, indicates that this company is indeed part of the group. The HK company is still directed by a Briton called James Mallaburn, a name that is unlikely to be a coincidence. Its web site still appears to be live too (archive), though not accepting new business right now. Still, as recently as January 2016, some nameless idiot in a bitcoin forum was asking whether Global Transaction Services (HK) Limited was legit. The answer really can’t be a confident ‘yes’, given GTS (HK)’s multiple connections to the rest of the GTS constellation, augmented by its proclaimed partnership with E-Transfer Technologies, which, if it’s not a software firm that says it’s based in Mauritius, is another former denizen of the Breder Suasso office suite in Georgia. Global Transactions Services LLC conducted payments through a European correspondent bank, located in Poland, mBank, whose previous name was Bre Bank. I would like readers to benefit from my unfortunate experiences with this company. Avoid working with the company COMPANY CREATION. A month ago, I asked them to open a bank account for my company, based in Dubai. After I had paid the service fees, Company Creation, in partnership with BREDER SUASSO, opened a bank account at Breder Suasso (a bank registered with the authorities in NEW ZEALAND). Until then, OK, no worries. I access the Breder Suasso INTERNET BANKING services. But now I can see that my bank account is owned by the company GLOBAL TRANSACTION SERVICES! Second point: the IBAN that was given to me is actually that of GLOBAL TRANSACTIONS SERVICES company! The funds do not belong to me! Third point: this IBAN is identified by SWIFT as being that of a Polish Bank, PEKAO, and not that of Breder Suasso! I’ve managed to identify their IBAN SWIFT. Fourth point: If Breder Suasso is a Bank and registered with the banking authorities in New Zealand, why is Breder Suasso opening accounts at a bank in Poland? Why couldn’t it create a company account with its own legal entity and its own information and banking data? So I asked for information. From Breder Suasso, cc COMPANY CREATION. They did not provide me with me clear answers. So I asked Bank PEKAO in Poland whether this IBAN belonged to my company or to GLOBAL TRANSACTIONS SERVICES company. In the end, I asked too many questions for them. I told them that I would request information from the Polish State Bank. Only then did [Pekao] tell me that if I want to create an account with them I must follow the classic procedure. Once again, they (Bank PEKAO) have avoided the subject. Fifth point: how is it that a Bank in New Zealand can create an IBAN with the information coming from Poland? It is not possible for a New Zealand Bank to create an IBAN for a company. IBAN is a codification which applies to the countries of the E.U., Switzerland and Andorra. Therefore, there is a partnership between COMPANY CREATION, breder suasso, GLOBAL TRANSACTION SERVICES, Bank Pekao. BREDER SUASSO is supposedly a bank located New Zealand but it’s impossible to talk to them during New Zealand work hours. They did call me, though, during the work hours of the State of Atlanta, Georgia, USA. This “UK company” turns out to be as tenuously connected to the UK as Breder Suasso is to New Zealand. Company Creations Ltd’s sole current director, Nancy Bennett is an obvious stooge, based in South Africa (or Benoni, which she appears to mistake for a country sometimes). Meanwhile Bennett’s predecessor, Brenda Patricia Cocksedge, also South African, and sometime resident of Mauritius, is such a celebrity stooge that she featured in a 2012 Guardian article about stooges. This high profile seems to have blighted her stooge career, in the UK at least, judging by the enthusiastic way she resigned from everything after the article appeared. One imagines the same fate awaits not only Nancy Bennett, but also Ukrainian Anatolii Shcherbak, who is another stooge for nearly 200 of Company Creation’s creations, and others’. Improbably, Anatolii is doing much of this heavy lifting from a flat in Swindon, UK, admittedly a somewhat more desirable location than Kiev, in strife-riven, impoverished Ukraine. Mind you, Anatolii sometimes thinks he is in Ukraine too, so he is as confused about his location as I am. I haven’t bothered to check whether Company Creations is registered with HMRC as a company services provider (TCSP) for anti-money-laundering purposes. Since there are no realistically enforceable UK sanctions against such remote-controlled entities, its registration or non-registration won’t mean much. In that respect, UK TCSP registration is somewhat like New Zealand FSP registration. Eurokasse…is “more of a complicated matter,” Dalton says. It started out providing advisory and investment services and then appeared to operate as a bank, that was “completely unregulated here.” Customers were from Germany and elsewhere in Europe. Liquidators work with a specialised definition of “fun”, as do specialist bloggers. For instance: it’s fun to wonder whether Global Transaction Services worked with Eurokasse as well as with Breder Suasso. How big a problem do Polish banks have? Recalling the federal indictment, mBank/Bre Bank’s details should already be expected to be all over the transaction records of Global Transactions Services LLC. It now sounds, from our Frenchman’s uncorroborated report, as if Bank Pekao SA will be conspicuous too. Unless both banks were filing all the SARs that GTS weren’t filing, which seems unlikely, they should expect some pretty vigorous encouragement from US federal officials to tighten up on their correspondent bank monitoring. J: The service of subaccounts is a standard service of corporate banking. There is a question if a bank has a duty to somehow verify firms that receive such a service. I will check that, however, if nobody has any complaints against BGŻ (a bank) for providing accounts to Amber Gold… Creditors are vetted but here we have a different service. B:…Providing accounts to Russians under false names or providing services to a fictitious/shell bank so it can launder money is a different matter, though. If I get a fine for speeding, they do not care if I do not know I was speeding due to a malfunction of my speedometer. So a bank cannot claim that it did not know, just because its compliance department has been failing. J: A bank is like a shop. In the grocery they do not do a body search of incoming clients. Maybe a bank should, I do not know the regulations. My gut feeling tells me though that until the client misbehaves…. …a bank doesn’t have to know anything about who’s operating the sub accounts? Tell that to Deutsche Bank, currently the subject of a $10Bn US-led moneylaundering probe in which slack monitoring of obviously high risk account activity is the core of the case against it. It doesn’t sound as if risk-based AML monitoring is the Polish way, just yet, but it may be just around the corner. 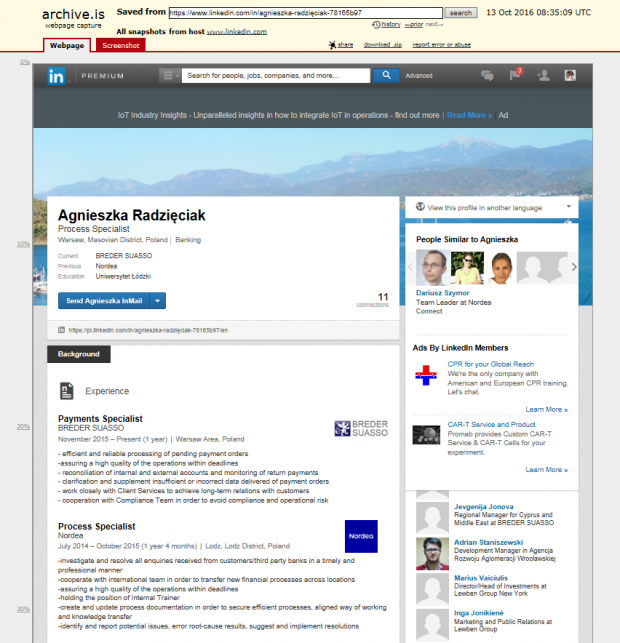 So we can conclude that in Poland, Breder Suasso is operating in a manner that looks just like banking, at least to its employee Agnieszka Radzięciak, who still thinks she works in the banking industry and used to work for something that definitely was a bank. And Breder Suasso seems to be pulling off this feat of impersonation via Global Transaction Services, via mBank and maybe Bank Pekao, and very possibly via its NZ FSP registration, too. From the Global Transaction Services indictment, one deduces that some powerful American agencies know all this already, or will find it out soon. That’s it with Poland, but we are not quite done with dubious New Zealand FSPs, nor with dubious barely onshore company agents in the UK, Global Transaction Services (Hong Kong), and dopey European banks. 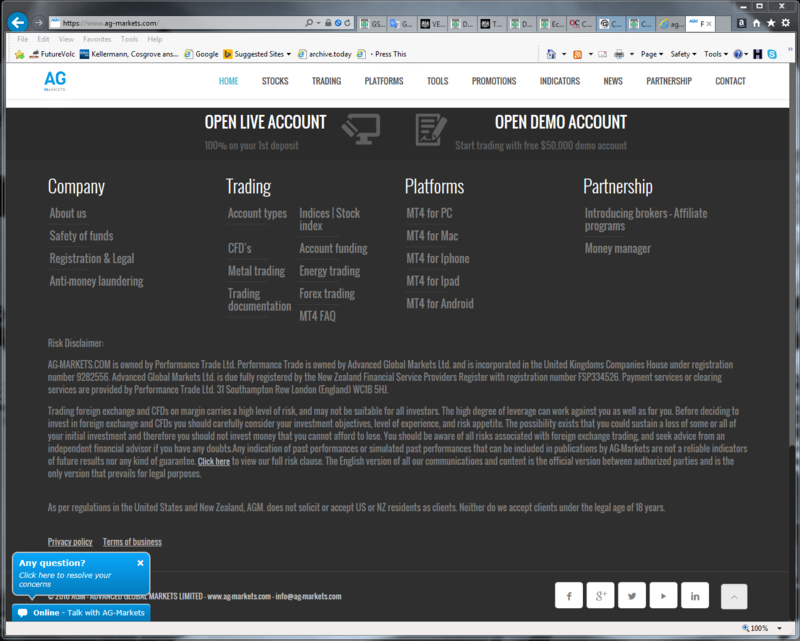 Let’s go next to www.ag-markets.com, one of many hundreds of utterly naff FX trading web sites out there on The Internet. Click the picture for a great big legible version. Unpacking all that: the UK company that owns AG Markets, Performance Trade Limited, is helmed by one Carlos Ferrer Montalvo, a resident of Barcelona, Spain, who, if this is the right LinkedIn profile, is more of a media sales type than an FX trading veteran. Performance Trade Limited was most probably created by its corporate secretary, Northwestern Management Services, another UK company agent that, like Company Creations, is actually run offshore, this time from the Seychelles. Not much of a UK presence there, to be honest. Again I haven’t bothered checking whether Northwestern Management Services is an HMRC-registered TCSP. It makes no difference to anything enforcement-related if it is or it isn’t, and I still hate the user interface. Performance Trade Limited’s parent, Advanced Global Markets Ltd, has an FSP registration, but this one is particularly meaningless, since neither of the directors even lives in NZ. From November 2015, NZ companies had to have an NZ director, with one exception: Australian residents who are also directors of Australian companies are allowed to direct NZ companies remotely. It is tempting to conclude that the particular Australian resident who joined the board of Advanced Global Markets Ltd at the very last moment, on 27th October, joined it purely to avert the removal of Advanced Global Markets Ltd from the NZ register. The temptation intensifies when one notices that the Australian in question, Peter Burslem, is a company agent himself, and a professional stooge. One of his previous forays into UK company directorship, at Jet Tech Industries, is associated with a billion-dollar disaster for Moldova. Jet Tech Industries, expertly stooged (most likely by Burslem’s predecessors) , was part of a group of shell companies that covertly took control of a Moldovan bank. There was a regulatory requirement to disclose ownership of more than 5% of a Moldovan bank. Accordingly the crooks just rustled up 21 shellcos, each owning less than 5%, whereupon they all acted as one, for some underlying person, who thus had complete control of the bank without the regulator even noticing. It’s a sharp lesson in why ownership disclosure thresholds are nonsense. A bit later on, with the help of that subverted bank, the crooks stole $1Bn, trashing the Moldovan banking system, and, not that they needed any more trashing, the tiny Moldovan economy and Moldovan politics, too. It’s pretty obvious from Jet-Tech Industries’ past stooge directors that from time to time Burslem works with Ian Taylor of the notorious GT Group. After nigh-on a decade of little mishaps, you’d think the NZ Companies Office would be on the lookout for folk with a relationship with Taylor, but they’re visibly not very systematic about it. This time, it’s not a Polish bank that’s been mugged by one of its correspondents, but a Czech one, Ceska Sporitelna A.S.
Oops: once again, American enforcers, who do not like it when someone messes with their dollars, may feel a trip coming on; to Prague, this time. So far, few of the major actors in this story come out of this looking all that great; not Breder Suasso, not mBank, not Bank Pekao SA, not Ceska Sporitelna A.S., nor AG Markets, nor two of the three “UK” company agents we have name checked, Company Creation(s) and Northwestern Management Services. Also not quite ‘on it’, we have the UK’s AML regime, the NZ FSP regime, Polish and Czech banks and regulators, and NZ Companies Office oversight. We also know of one blogger who feels he has underperformed, too, and for years. At least GTS of Russia still look reasonably perspicacious; they did a Breder Suasso road test. Unfortunately a quick look at the corpus of Limited Liability Partnerships registered at their London address indicates that, while they may be cautious about testing their payment servicers, they aren’t too fussy about where they source their second-hand shells. Their Vertical Alliance LLP bears in its history not only the unmistakable Vanuatuan fingerprints of the profoundly dodgy GT Group of a couple of paragraphs ago, but also traces of International Offshore Services, stars of the giant Deutsche Bank-Yanukovych-Manafort-CIA-etc money laundering story, from which anyone unfortunate enough to click on a link to my last blog post may have only recently escaped. In a letter to HM Revenue & Customs (HMRC) last month, lawyers acting for Hermitage said a company services firm, GSL Law & Consulting, with offices in London, had acted as an agent for some of the companies involved in the fraud. The letter said GSL’s role meant it should not meet HMRC’s “fit and proper” test for companies providing offshore company services. Alexander Alexeev, managing partner of GSL, said his firm dealt only with the formation of companies and was not involved in their business or other operations. However, Browder said the UK authorities’ failure to act made a “mockery” of David Cameron’s call at last week’s G8 summit for a crackdown on tax evasion. “The UK has rolled out the red carpet for money launderers, who it appears can come to this country and act with impunity,” he said. HMRC said it was unable to discuss individual cases “for legal reasons”. By “fraud” Browder means the Magnitsky cause celebre, of course. Here is lots more on GSL’s involvement in it. Three years later, and despite Browder’s thunderbolts, GSL still has a London presence. Yet its selection of clients, shellco providers and money transmission candidates is clearly about as sleazy as it gets. Browder has a point. Customers registered with the New Zealand company Breder Suasso have a serious problem. They have been informed that bank accounts opened and maintained through that entity have been closed with immediate effect. It is known that the company is extinguishing all of its activities related to Poland. In the aftermath of an article in „Gazecie Polskiej”, doubt piled up around the business of Breder Suasso. According to the notice received at the public prosecutor’s office, the New Zealand company offered to open “secret” bank accounts, also in fictitious names. In this way, it could seek to bypass sanctions imposed on Russia after the annexation of Crimea. It’ll be interesting to see how Breder Suasso’s Polish partners, mBank and maybe Bank Pekao, navigate any fallout, and whether some Polish government representative eventually ends up in a tense conversation with someone serious from the US Treasury. A year ago, there was just such a conversation in Latvia, in the aftermath of the Moldova bank scam, a fraud only a little bigger than GTS’s allegedly laundered hundreds of millions. The chief Latvian bank regulator’s subsequent crackdown was insufficiently enthusiastic for influential onlookers, and he lost his job. It’s time to round up this post, at last. Breder Suasso is still registered, but not regulated, as an FSP in New Zealand. Tens of millions of dirty dollars have moved via its one-time associate Global Transaction Services (UK). The US DoJ thinks hundreds of millions more have travelled via another very possible Breder Suasso partner, Global Transaction Services LLC. Now the Poles seem to think Breder Suasso’s been opening secret dollar accounts. It is the ideal time for FMA to slam the stable door. As for the reforms that might help make the very difficult FSP monitoring part of FMA’s job faintly feasible, the NZ Government may of course prefer to defer them until some soft-spoken American official rocks up. Persuasive words from Americans might help us straighten a few things out in the UK, too, though I wouldn’t bank on it. Penultimate thought: at a high concept level, the idea of a “payment provider”, little more than a piece of trite software, wrapped in an opaque offshore entity, that interposes yet another layer between dodgy clients, devil-may-care company agents, dopey banks, and clean dollars, promises to provide copy for people on the fraud and money laundering beat for years to come. That’s for later, though. Right now, this blogger would like to extend extra-special thanks, to Witold Smyk, a member of the Polish association SBB, which stands for Stop Bankowemu Bezprawiu, or “Stop Banking Lawlessness”, for a lot of help with this post. Thank you, Richard. Love the glee with which you turn over the stones and pull up the carpets. I live less than 10 miles from 1841 Piedmont Road, Marietta GA , Cobb County. Would you like for me to stop by and check out if there is anything or anyone still there? I also have a subscription to Georgia’s land records database, and could run any names and/or addresses through it to see if I turn anything up that way. I have been involved in litigation regarding a Deutsche Bank entity for seven years, and feel that I am within about a week of marching all of the litigation and evidence up to the DOJ. (The litigation just got “bumped up” from state to federal court last week.) I don’t know if the corruption and fraudulence that I have found has anything to do with corruption and fraudulence that you have found, but if there is a pattern of similar corruption and fraudulence that can be demonstrated to suggest the breaking of Georgia State RICO Laws and/or Federal RICO laws–things get interesting to the DOJ. It was just reported within the last week that The Georgia State Attorney General, Sam Olens, is resigning to take a position at a local state university and is being replaced by someone named Chris Carr. It is not uncommon in GA for politicians and judges here in Georgia to resign or retire right before an election (in my opinion) so that the new and “appointed” politician or judge can run in the election as an incumbent. (http://newstimes.augusta.com/opinion/2014-10-29/nathan-deal-and-the-scandal-that-wont-go-away) Along with an FBI agent, the prosecutor that was investingating Governor Deal reportedly went in to serve a subpeona upon him. No one knows what happened other than that, except that the prosecutor was (very quickly) appointed by the governor to State Superior Court bench. It’s sorta scary how politics are run in Georgia; I’ve become uncomfortable living here and I’m very anxious to move. (Btw, there is a Piedmont Road in Atlanta, GA, which is in Fulton County, and it’s a major and well-known road. The Piedmont Road that you mentioned is a relatively “off-the-beaten-path” road and in a different county. (Cobb.) You can just use Google Map and use the street view tool to have a look at it.) What comes up on Google Map is actually a different but close address; I assume that an office next to or nearby, or possibly within the one you noted. It is also possible that no such address exists–which is another reason I thought I might drive past and see what the deal is. If you need any other Georgia (USA) info or tracking down of info, feel free to contact me via Naked Capitalism, if possible. Or just reply to this post and let me know the best way to contact you. Thanks for your investigation. I will peruse what you have found more thoroughly and see if I can find any possible links to the litigation with which I’m involved. I am currently doing some cursory browsing in the Georgia (USA) land records database–looking up some of the GA-related names, addresses, etc. from your post. Interestingly, there is a document linking Hannah Vernex-Loset to Daniel Barrs. (A POA being granted by Daniel Barrs to Hannah Vernex-Loset.) In this POA, granting a POA from Daniel Barrs to Hannah Vernex-Loset, Daniel Barrs represents himself as being a resident of Fulton County, GA. The document was filed with the Fulton County Clerk of Court just last month, on September 13, 2016. I have only been at this for an hour, so I might come up with much more info–or possibly nothing. This is just the beginning. Okay…back to perusing the database. Hannah Vernex-Loset is the daughter of Daniel Andrew Barrs. On the 30th of June 2016, they put through a name change for GTS HK and their license. They are now called EHKONNECT. On the 2nd of Aug 2016, James Mallaburn changes the name of his UK company from GTS SUPPORT SERVICES LTD to ACG SUPPORT SERVICES. On the 2nd of Sept 2016, James Mallaburn and Hannah Vernex-Loset, change the name of their Polish-registered company, Global Transaction Services to Itran Sp. zoo. That is super! Thank you for the lead. This is gonna take more than Shaggy, Scooby, and the Mystery Machine–isn’t it? up until recently, there HK MSO license was held under the name of GTSHK before changing to EHKONNECT, but if you do a search now (https://eservices.customs.gov.hk/MSOS/wsrh/001s1?searchBy=V ), then you will find that the license name has been changed again ?? to another MSO HK company, VALORIS LTD.
Take a visit to the aforementioned website and you will find it uses the same login engine that all GTS MSO websites use. Finally, take a trip over to TD Markets another one of those abysmal forex platforms and discover more GTS/VALORIS funding instructions, again to Poland. Is this normal behaviour ?? This is to correct my post from yesterday, after checking HK license website again it would appear that EHKONNECT do still show they have a licence. Apologies I somehow overlooked that. I hope it’s not too late for this to get seen . . .
which just aren’t the type of errors made by even the most poorly educated native speakers. I can see lots of motivation for this, because I recall years ago noticing that one of the business addresses you mentioned was in a residential block I used to drive by near the base of the Harbour Bridge – not a commercial area at all. Clearly, those offering such services are getting their act together, and clearly the NZ government doesn’t care – or is even pleased. Thanks Downunderer, I’ll take a look. Most recent ‘active’ account was with FX United (a Ponzi that’s blowing up spectacularly right now….plenty of blow by blow posts on Behind MLM). 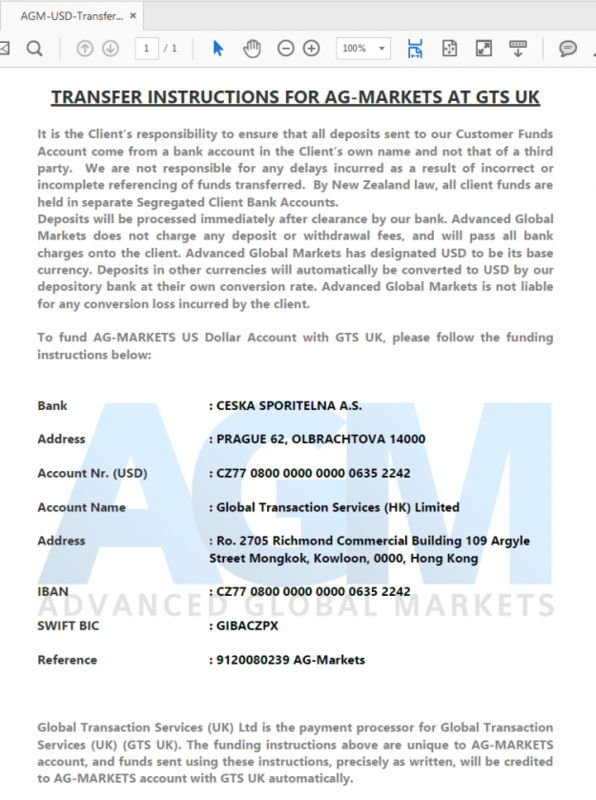 I’ve posted images of the dodgy FX United (on NZ letterhead) invoices & instructions to send GTS HK Czech Republic bank account. After going through my notes in evernote I’d forgotten just how many bent FX Ponzi’s GTS serviced. So I’ve posted a few more. jakal.postach.io. There’s a few posts there on some OSINT I’ve done on Priscila Lustre Taylor (aka. Mrs Taylor of GT Group). I hadn’t heard of her or the GT Group until her name popped up (well a version of it) when FX United was playing pass the parcel on the shareholding and directorships for their NZ fake front company (United Global Holdings). Ausecorporate.com.au (well the Australian Company behind the site) lodged the notices for Ms. Priscila. They have a nice new website run by Ian Taylor and Robin Taylor….and Peter Burslem who you mention just happens to be the managing director. Somewhat amusing its hosted in Romania. They must still get mates rates in that part of the world. I’ve got a bucketload of good intel that I’ve collected. I’m much better at finding it than trying to write it. I’d love to share it. Better to be sifted through and made use of than sitting in folders unpublished.